Yesterday, I talked about the current projects on my needles. I should have added the example swatches for my Knitting Class. I have six more of those to do. But now I can get back to work on that one, since I am finally FREE from obligation! And I FINALLY finished my FIL Mitered Square Blanket (as the previous post shows), but my hands still wanted to knit. (Knit every day for a week, and they get suddenly want more!) I hadn’t really expected to finish early (we were visiting relatives, so I was chatting and knitting, and suddenly it was done), and I hadn’t brought anything else to knit on. So I cast on with some blanket leftovers for something to do. 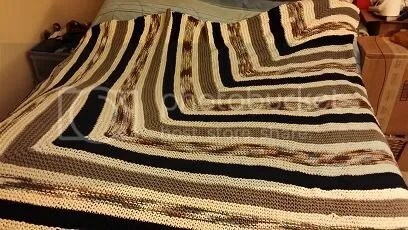 As it is still Father’s Day (for me – I currently have 5 1/2 more hours), I thought I would show you the completed blanket! I think next time (yes there will be a next time), I will include a I-cord edge, as the selvedges sometimes look a little rustic. We went to visit family on Saturday, so they saw the blanket I was madly trying to finish. And one family member wistfully wished for one out loud. In purple. And she’s a sweetheart… so… yeah. I’ll probably be casting on another of these neverending blankets sometime in July. She’s shorter than my father-in-law, so I can cast on probably 220 stitches and be okay. 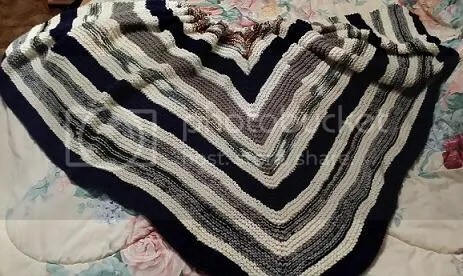 The finished adult-sized blanket measures 88 inches wide by 95 inches long. Yeah, it’s HUGE. Now all I have to do is weave in all my stray ends, take a picture, measure it, then wash it. I am at about the 70% mark on the FIL blanket. I’m making good progress, although the numbers will lie to you. As it is all decreases, the rows are getting faster, so they take less time to complete. I haven’t taken a picture of my progress yet, but I have knitted approximately NINE more stripes from that picture. And of course there is also the colorwork hat. It’s STILL on the back burner until after Father’s Day. No cheating. I don’t have the time. How to do a Russian join! ATTENTION: I have FINALLY reached halfway on the FIL blanket! WHOOOOO! Now I all I have to do is knit madly for the next two weeks, and it should be done by Father’s Day. And of course there is also the colorwork hat. It’s on the back burner until after Father’s Day. I cannot afford to get distracted by it’s yummy color-y goodness. STOP TEMPTING ME!